We were greeted with a request... "I want to have a bunk bed Mum... can I have one!" This was agreed.... then a few weeks before Orlando's 5th birthday he reminded us of this agreement, telling us that he was excited to get a bunk bed for his 5th birthday..... right we better get organised! We looked at an Ikea bed that had a tent over the top but then realised it was not very high at all and that's not really very much fun! The whole joy of a bunk is seeing the world from up high! It was just want we wanted! But at $3250 it was slightly more than we were wanting to spend on Ollie for his birthday! Also thorough discussion with Orlando we decided that instead of having a second bed underneath we would make a lego /cubby space. This would allow a mattress in there if a friend was to stay, but would provide Orlando more room space for the rest of the time. So we decided to be cheap skates and make it ourselves. This was we could save money and make the modifications we wanted. He carefully jig-sawed and sanded each piece, making them beautiful. Then he brought them outside where I dusted and painted them with 3 coats of stain. Then it was ready to bolt together! This took a good part of a day to put it all together but we were really happy with the newly finished bed! Ollie took a little while to get used to being in a loft bed but now loves it. He adores playing underneath and I love that I can put all his constructions under and still sweep/mop the rest of his bedroom. We're happy and all for about $500 and a weekends work! 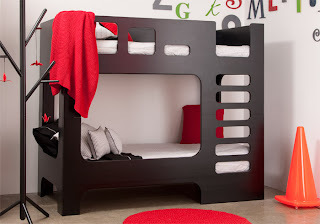 We now have a custom sized loft bed that we think looks pretty funky! If you would like plans to this bed then we would be happy to share and keep the inspiration chain flowing!! I love being inspired by others! So THANKYOU to all those who provided input to Orlando's beautiful bed! I would love if you would be willing to share your plans for this bed. Hi Amanda! You have challenged me to figure out how to link the plans here as I hadn't done it before! Turns out it is not to hard at all :) So it should now be linked in the post... let me know if it works for you! Wow, thanks for the quick response! It requires permission to access the file though, so you may be receiving a request for permission from me. Thanks again! Perfect! The bed is beautiful. Thank you!